All the world may be discussing American politics but I have my own disaster, which is particularly sad news during summer. My KitchenAid Ice Cream maker has sprung a leak and nothing we try seems to be able to repair it. I am sad that such a reliable piece of my kitchen equipment hasn’t stood the test of time and use as it was only 10 years old and I know it hasn’t been dropped. I noticed iridescent blue droplets in my freezer drawer and wondered where it had come from. I knew we hadn’t been drinking blue curacao cocktails so thought it might be the purchased icy poles that my husband had bought for the grandchildren. Because I can be quite spontaneous in my cooking, I prefer to keep the ice-cream maker in the freezer so that it is always ready to use. As I lifted the ice-cream maker tub from the freezer I saw small droplets down the side under the little prongs. Not realising that they had originated from the ice cream maker I wiped them away and used it. I adore making ice cream and my family love eating it. They will eat it for breakfast if they think they can get away with it. When I take the lid off the container, I often find finger marks swirling around on the surface and the volume gradually decreases whether I have served it or not. The mysterious freezer night raider strikes again. Even the 2-year old grandson knows where to find it in the freezer drawer and boy does he look disappointed if he cannot find any. I mean really Nanna, you have let the side down! My fig tree has been bursting with beautiful foliage and I was thinking of what I could do with these flavoursome leaves. I wrap fish in young fig leaves and cook them under the grill for a quick and delicious summer meal. The leaves impart a citrusy coconut flavour to the food and this is one of the nicest ways to serve fish. I leafed through the emails my sister had recently sent over in which we discussed our favourite restaurants and chefs in London. She has a professional ice-cream making machine which I envy but then again I don’t need to feed 12 people very often. One of my treats, when living in London was to go to Brett Graham’s Michelin star restaurant The Ledbury. His food is imaginative and delicious and I have been enamoured with the flavour of fig leaf ice-ream and granita. I also follow another wonderful chef, Maria Elia who uses fig leaves to flavour a panna cotta. Now I planned to make fig leaf ice-cream. I pulled out the recipe my sister had sent me which uses yoghurt to lighten the custard base. I picked the healthiest looking, most luscious unmarked fig leaves, prepared the custard and pulled the ice cream maker from the freezer. This time I didn’t see any blue droplets so unknowingly I poured the mixture into the freezer bowl and set it to work. The ice cream took a long time to get very cold and naturally I blamed our hot weather. Eventually I decanted the still soft mixture into a container and put it in the freezer. That is when I noticed the disaster waiting to happen. There was a blue ring of liquid coating the bottom of the ice cream maker and leaving a mark on the kitchen bench. Sadly, I think this means it is the last time I can use this machine. However, the ice-cream was delicious. Here is the recipe my sister sent to me. I don’t know it’s origin but it may be from Brett Graham or Maria Elia or she may have adapted a recipe and created this one. Combine milk, cream, sugar, glucose, lemon rind and vanilla seeds in a stainless-steel saucepan. Bring to the simmer then remove from heat, add fig leaves and leave to infuse for 20 minutes. 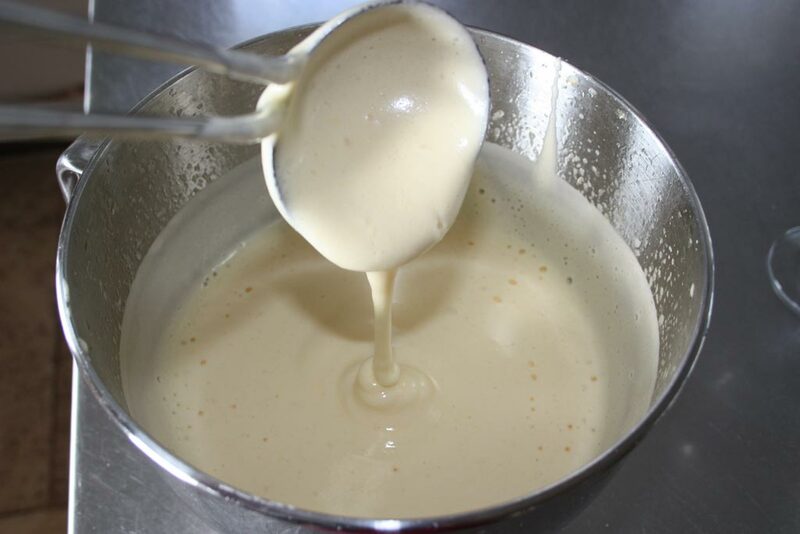 Strain the mixture into a bowl and once it is cool, add yoghurt and whisk vigorously to incorporate. Strain again before churning in an ice-cream machine according to manufacturer’s instructions. 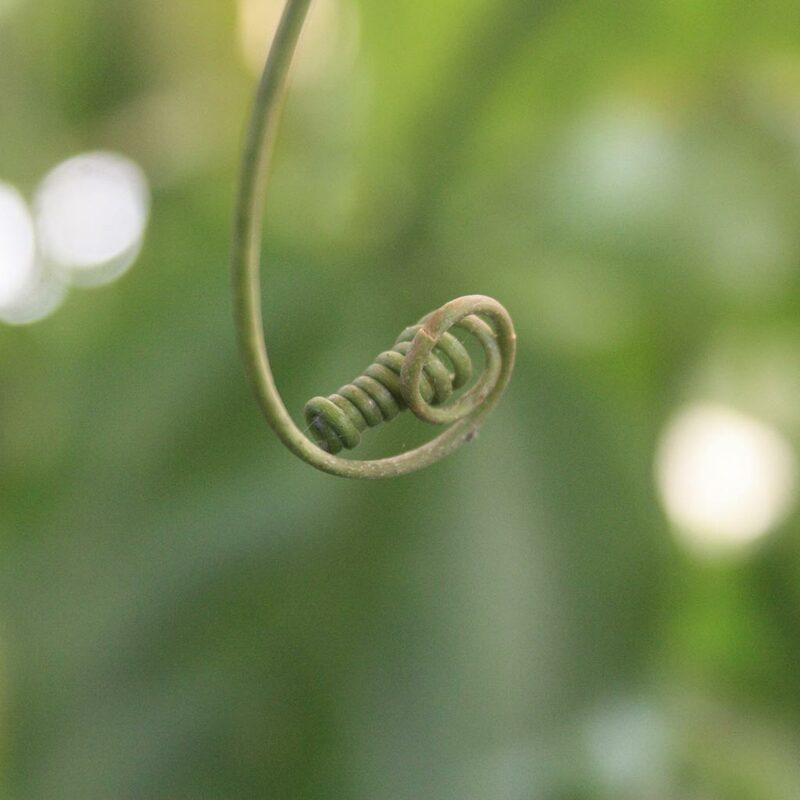 This entry was posted in Desserts, Food, Ice-Cream and Sorbets, Uncategorized and tagged Desserts, Fig Leaf, Fig Leaf Ice-cream, Ice-cream, KitchenAid Ice Cream Maker on February 8, 2017 by lorikeetlady. 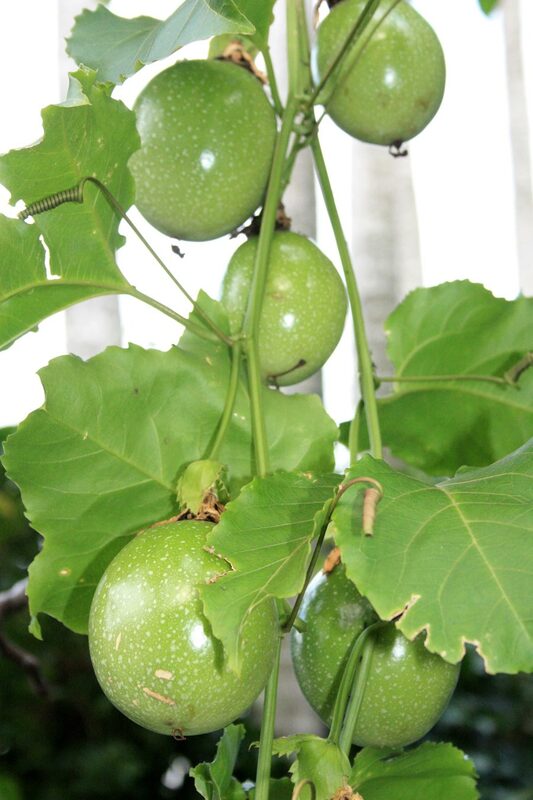 I am still trying to use up all the passionfruit that sit on my vine. My sister reminded me of this flummery that our mother would prepare when we were children. 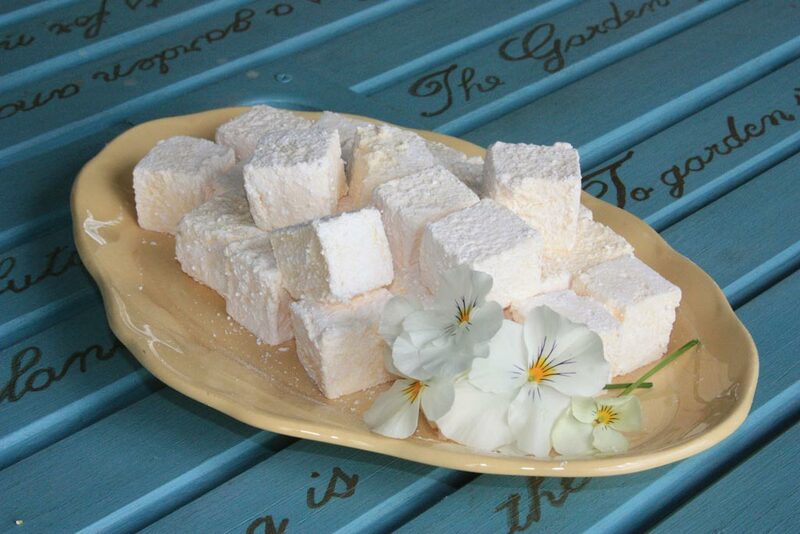 It is an old recipe as it was handed down from our Grandmother, Marie Florence Young. Neither of her daughters can remember whether she inherited from her mother, was given it by a friend or found it in a recipe book. 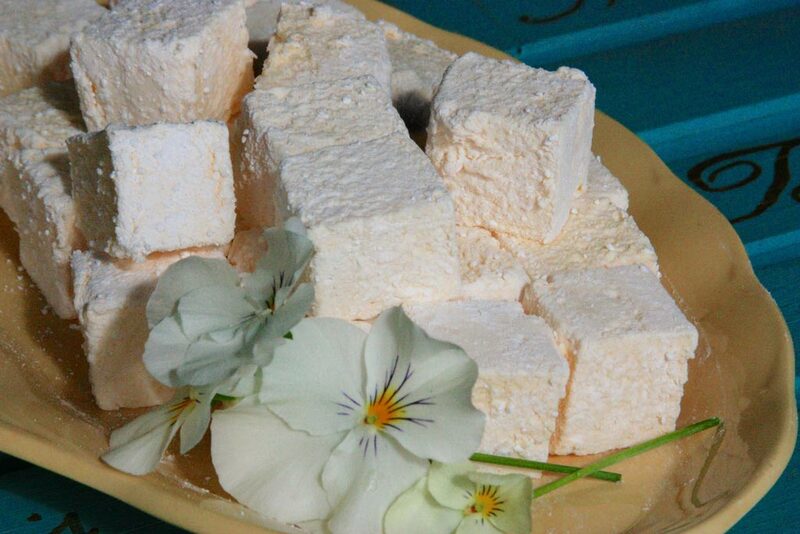 It is a lovely light sweet dessert, quick and easy to make. The ingredients aren’t expensive which is perfect when you are trying to save money and still entertain. Dress it up with a shortbread biscuit and a little passionfruit pulp and it looks as if it has taken all day to prepare. You can also serve it to guests who are on gluten or dairy free diets which makes it very versatile. When I first made it, I hadn’t realised what a large mixture it is. I had pulled out 8 of our very old-fashioned champagne glasses which have flowers etched into a pattern on the side. These looked very pretty when filled but I had to keep pulling out the old unused glass and ended up with 11 champagne and parfait glasses filled with the flummery. If you don’t have that many glasses you can always pour the mixture into a large bowl and serve it from that. In a medium sized saucepan, add sugar to water and stir over a gentle heat to dissolve the sugar. Pour in the orange juice and lemon or lime juice and the blended cornflour mixture, stirring continuously to ensure the cornflour is completely blended with the liquids. Increase heat to a gentle boil and cook for about 3 minutes until the cornflour is cooked and you cannot taste the flour. The mixture will be a viscous (thick) clear liquid. Scoop out the passionfruit pulp and blend it quickly in a food processor to separate the seeds from the pulp. 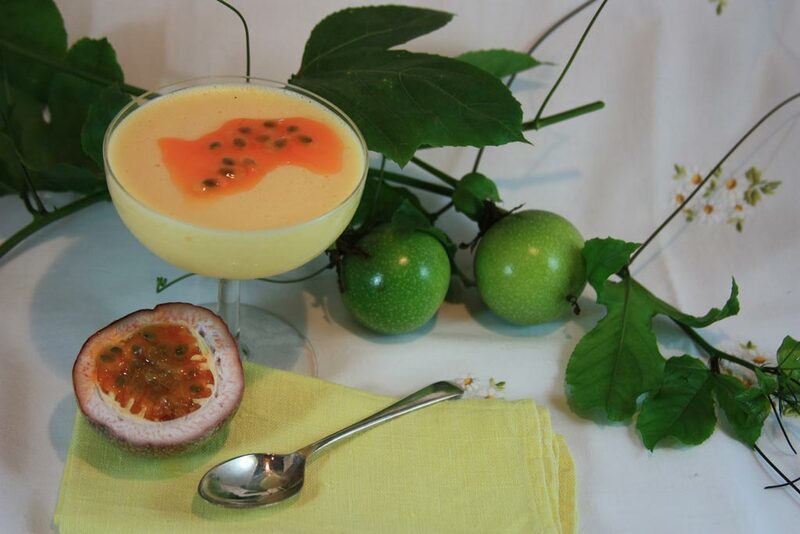 Strain the passionfruit juice into a bowl and sprinkle the gelatine powder over the top of the juice. Don’t stir, just let the juice absorb the gelatine. If not all the gelatine has dissolved, place the bowl over the top of the saucepan for a minute to warm the passionfruit juice and very gently blend in the powder. When the gelatine is dissolved, pour the passionfruit juice into the saucepan and stir well. Now pour a little of the juice mixture into the base of an electric mixing bowl and using the whisk attachment, start to beat the mixture on a slow speed whilst slowly pouring the remainder of the juice into the bowl. Gradually increase the speed and whisk the mixture for about 20 minutes by which stage as it cools it will become a light creamy colour and very frothy. 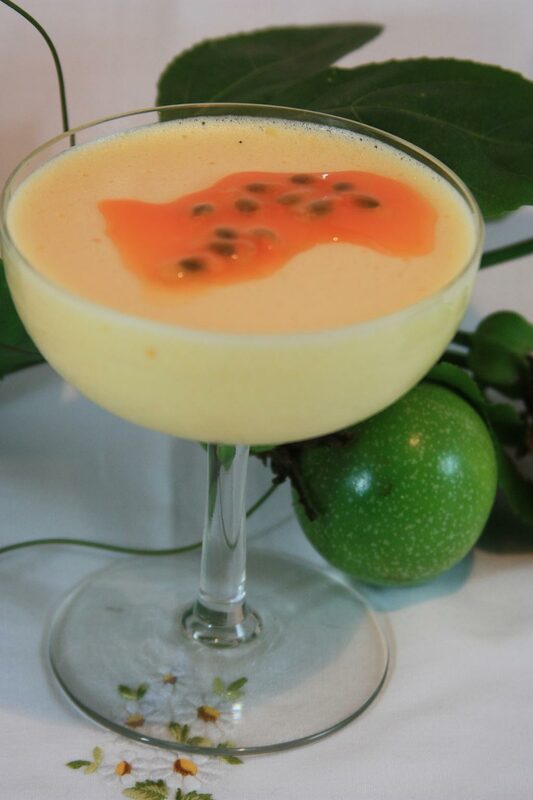 The passionfruit mixture becomes a light creamy yellow and very frothy with lots of minute air bubbles. Pour the flummery mixture into individual cups or glasses or into a large bowl. Place in the refrigerator to set. Decorate with a little passionfruit pulp. 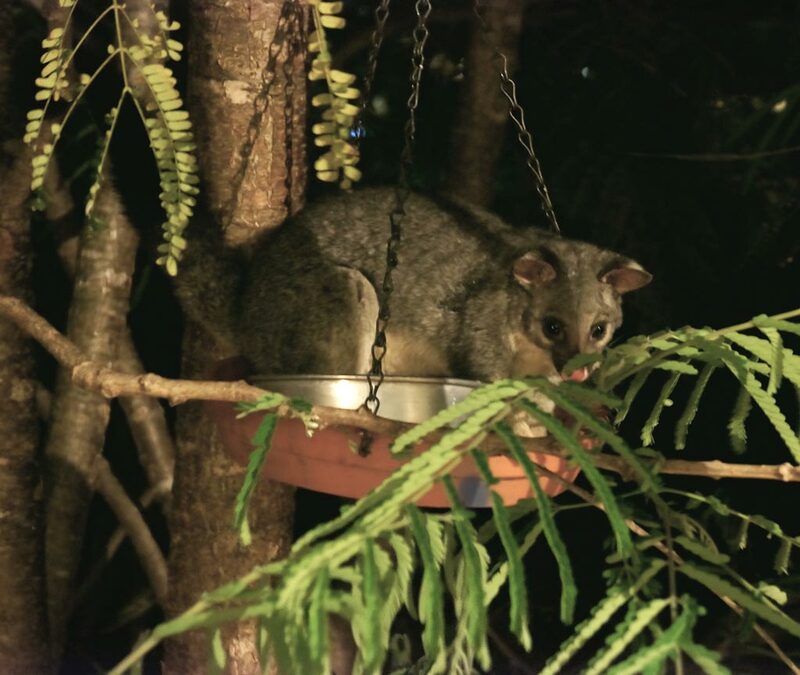 This entry was posted in Desserts, Food and tagged dairy free dessert, easy dessert, fruit dessert, gluten free dessert, low cost dessert, passionfruit, Passionfruit Flummery on June 29, 2015 by lorikeetlady.